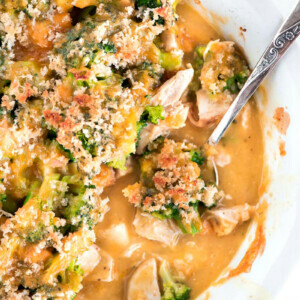 This simple chicken casserole recipe is a family favorite! Spray a 9 inch pie plate with nonstick spray, and preheat the oven to 425 degrees F.
Place the chicken in the bottom of the pie dish and top with the steamed broccoli. Sprinkle with salt and pepper. In a medium bowl, whisk together the cream of chicken soup, chicken broth, and yellow curry powder. Pour this mixture evenly over the broccoli and then sprinkle with the cheddar cheese. In a small bowl, combine the breadcrumbs, Parmesan and melted butter. Sprinkle over the top of the casserole. Bake for 20 minutes until bubbly and golden. Serve over steamed rice, if desired.